Yes, you read that right. We are moving to Idaho! I’m excited to share this story with you but I thought I’d jump straight to the point so you can decide if you want to stick around for what may be the longest post I’ve ever written. It may be long, but I promise…it’s a good story. April was nothing short of a whirlwind for us. It entailed bringing a dream to fruition after a long, hard year of soul-searching. The start of a new chapter in our lives that very nearly came to a close before it ever began. A new chapter that will be a total departure from anything we’ve ever done. We’d been seeking a new pursuit for some time, we just didn’t know exactly what that looked like until now. Idaho’s Treasure Valley, where we’ll soon call home. For the last 14 years, Mark & I have owned a business together and for roughly the last, maybe 4 years or so, we’ve questioned what’s next for us. Doing the same thing in the same place for 30 years was never the path we saw ourselves taking. But we’d found a great deal of success in our business and lived in a beautiful place. We were comfortable, why rock the boat? Because you only live once and we try to never lose sight of that fact. We were un-stimulated and deep down we had begun to crave a new pursuit, a new challenge. We knew if we didn’t actively pursue a change, those 30 years would pass in the blink of an eye. The trouble is, change doesn’t come easy or cheap and we had no idea what it was exactly that we even wanted. During this time, Mark obtained his private pilot’s license and continued to pursue his passion in aviation, strictly for fun. Though owning an airplane was something we talked about often, it felt just out of our reach. When we finally made that happen in 2016, we were elated. But, the more Mark flew, the more he wanted to fly and flying was an expensive hobby. It was this weird, giant puzzle piece in our lives that we just couldn’t figure out where it belonged. We questioned constantly if being involved in aviation made any sense and if we wanted to continue to afford it. While we never had solid answers to those questions, I knew one, pivotal thing to be true…being a pilot brought out the best in Mark. I had never before seen him as happy or as focused or as invigorated as he was when he was doing anything that had anything to do with aviation. When something in life brings you that much satisfaction, you can’t ignore that. We had no idea where aviation would lead us, we just knew that you can never go wrong pursing that which lights you up inside. We believe that pursuing your passion is how opportunities are born. When we pursued our individual passions for photography 16 years ago, we never would have guessed that not only would that lead us to each other but to a thriving career. When we pursued our passion for camping and bought our truck camper, we never would have guessed that those adventures would lead us to a new way of life and a new relationship with our money and material belongings. That knowledge fueled our desire to see where aviation could take us. 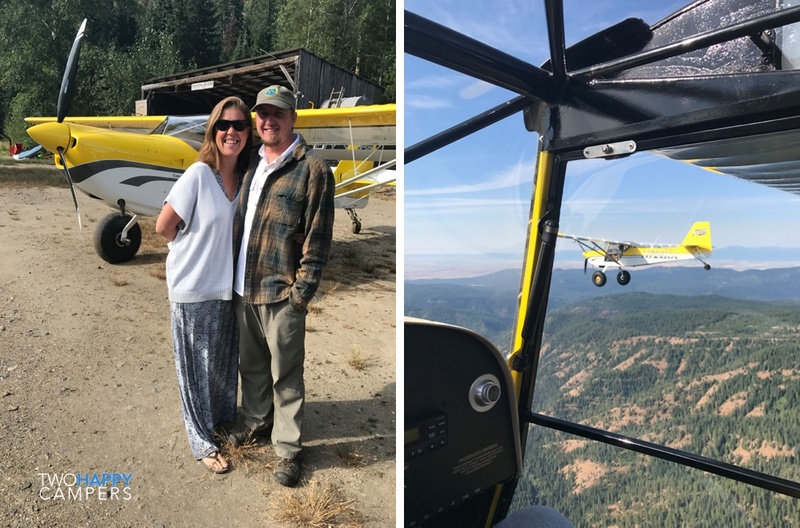 Back in 2015 Mark traveled to Idaho for back-country flight training with a highly sought after flight school specializing in tail-wheel instruction in Kitfox aircraft (the kind of airplane we later bought). It was the trip of a lifetime and an experience Mark would never forget. Nearly two years after that trip, in April of last year, Mark wanted to return to Idaho for further Kitfox-specific training. A last minute decision that would change the course of our lives. During that trip last Spring, the owner of the flight school offered Mark the opportunity to become a flight instructor for his company. The moment in which Mark shared that news with me is a moment in time I’ll never forget. It brought me to tears. We’d been seeking a change but hadn’t found an opportunity worth reshaping our lives for until now. We didn’t hesitate to announce to our friends and family that at the end of the year (2017) we would move to Idaho. The fate of our business was uncertain and how the transition from Colorado to Idaho would unfold, we weren’t sure. Fast forward to August of last year. We managed to find an 8 day window during the busiest summer our business has ever had to fly to Idaho and begin searching for a house. During the course of that week we scoured every corner of the county and beyond. The agricultural valley of Southern Idaho was such a vast departure from life at 8,000’ in the Colorado Rockies that the wind was quickly removed from our sails. We didn’t see a single house that got us excited about the move and with that we began to question everything. We returned to Colorado confused but with little time to think about it. Our house was under contract, set to close in one short month, and business was in high gear. There was no time to think about the future. Funny thing was, we had decided to sell our house and go live on the road before the Idaho opportunity ever arose. If Idaho wasn’t going to work (a decision we hadn’t yet settled on), we would return to our original plan. Living on the road fulfilled a dream of mine but it came at the cost of leaving aviation behind. Leaving our airplane in a hangar in Colorado when we set off for life on the road last year made no sense to us. At that point, we weren’t sure what made sense. We were hoping the freedom of the open road might have answers. While our minds were telling us that Idaho may not be the answer, our hearts were telling us otherwise. Every single day for the last year we have talked about moving to Idaho but we didn’t know if it made sense. Paralysis by analysis at it’s finest. What we did know was that if we didn’t do it, we would wonder until the end of time what would have happened if we had. That thought was at the heart of our decision to return and once again see if we could find our place here. We returned to Idaho at the beginning of April with our sights set on a specific goal. Could we afford to build our own hangar home at the airpark where Mark would be working? That was the one place in the area that we loved and could see ourselves living. When we arrived our motto was this “keep our minds open to all the possibilities, explore every option”. With that, I downloaded the realtor.com app and set up notifications so that I would get an alert for any new listing within our price range in the town nearest to the flight school, just in case there was a house out there that would work for us. We peppered our realtor, potential neighbors and the airpark developer with questions about building a hangar home. We drove around looking at houses in the area. We floated the idea of just living at an RV park until we figured out something else. By the end of the week we were fried. When we have an idea we go deep in to research mode and don’t stop until we have answers. Unfortunately, the answers we got weren’t the ones we wanted. We determined that building a hangar home was barely within our means and had the potential to strain us financially. Of all the houses we drove by, not a single one sparked our interest. The RV parks left a lot to be desired. With that, we said our goodbyes. Living in Idaho, it seemed, just wasn’t meant to be. If you’re thinking we must be picky about what kind of house we live in, we are and we’re not afraid to admit it. I refuse to live somewhere that doesn’t inspire me. Our house in Colorado didn’t come easy either but it was the best decision we’ve ever made and living there did nothing but change our lives for the better. We wouldn’t settle for just any roof over our head, it had to feel right and so far nothing had. At this point we we’re trying to recalibrate. Where would we go from here? Our mid-life crisis had taken a tight grip on us this winter. Living on the road, while an amazing experience, wasn’t challenging us. It was a way to live, not a way to make a living or pursue a new goal. And there were zero other prospects. As we were packing up to leave Idaho, my realtor.com app lit up my phone with a notification about a new listing. My jaw dropped in disbelief the moment I saw it. Not a single home had come close to meeting our needs and desires…but this one had it all and then some. We were so emotionally drained at that point that Mark wasn’t even sure he wanted to see it. But if there is one thing Mark and I always do, it’s that we ALWAYS pay attention to the signs…to any messages the universe, or the gods or whom or whatever may be trying to send us a message. And this notification on my phone was a very clear message. It was because we’d exhausted every option and detailed out exactly why those options didn’t work that we were able to clearly see the one that did work and know exactly why it was perfect. 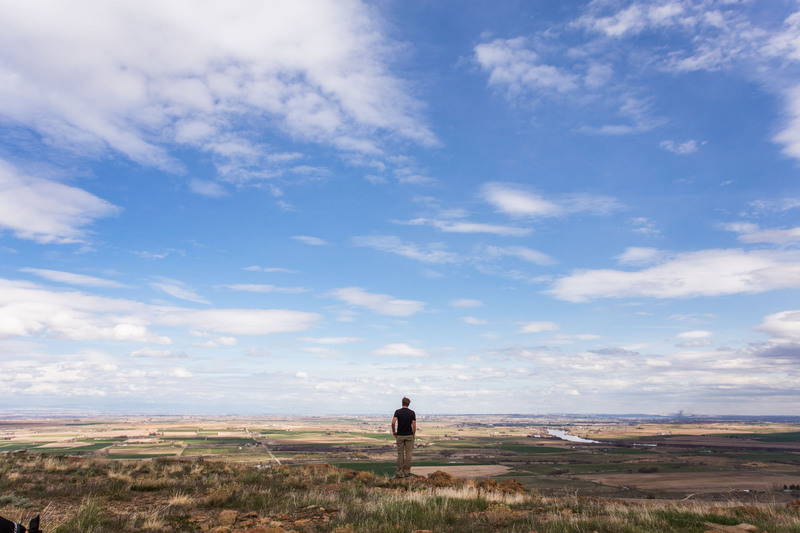 It was because we felt a pit in our stomachs when we said our goodbyes the day before, we knew that we did, truly, unequivocally want to live in Idaho and build a new life around aviation. Our minds have played some tricks on us over the last year but our guts have done nothing but draw us here, to Idaho, to an opportunity to be a part of something that inspires us both. An opportunity that has brought me to tears it makes me so happy. We made an offer on our house within an hour of seeing it. It came as no surprise that from that moment on, everything began to fall in to place. The road to get to this point has been rough, we’ve gone back and forth and back again on the Idaho idea more times than I can count, but it couldn’t have played out more perfectly. We searched our souls all winter long and now we know this is exactly where we are supposed to be. Will we miss living on the road? Of course, it’s an absolute blast. But the thing about it is, that opportunity is more open-ended than this one. I won’t be at all surprised if one day we’re out doing it again. Not to mention…we will still have plenty of time to travel during the winter in our truck camper like we always have. This opportunity for Mark will not always be here and it’s one that can’t be passed up. We refuse to live our lives wondering “what if”. When something lights a fire inside of you, a fire so bright that you can’t, for one single day stop thinking about it…you can’t ignore that. No matter how challenging that goal or dream may be to attain, if you feel lost without it, you have to go for it. It may not make any sense at first, but it will. It may not be easy, it may be risky, it may lie way beyond your comfort zone but pushing past all that is where the good stuff lies. We don’t know how this is all going to shake out. We have no idea what the future holds for us. What we do know is that it feels right and Mark & I are more inspired than we’ve been in years. That’s all I need to know to go after this new life with an open heart and renewed sense of purpose. Many have asked what I’ll be doing in this new setting and that answer is simple. I always have been and always will be a photographer. I’ve known that since I was a kid and life on the road has helped me to rediscover how much that means to me. During the summer I plan to commute back and forth to Colorado where I hope to continue to see our business thrive. However, for the first time in our marriage, we’ll be a dual-income family and with that I’ll have the freedom to book less work or only the jobs I’m really excited about. And as we put down roots in Idaho, I look forward to seeing where my camera takes me. Who knows, I always have had a thing for aerial photography. Something you’re bound to see much more of here on this little website of ours. Congratulations! I’m so glad that this opportunity is working out for you both. I am an Idaho boy: born in Idaho, and lived in Idaho most of my years. I used to live in Treasure Valley- Nampa doing my working career, but now I am retired and live in Magic Valley- Rupert. Rupert is my hometown, just 2.5 hours south of Stanley Basin, the headwater of the Salmon River, and just 2 hours south of Sun Valley, the gateway to the Sawtooth Mountains. With my 4WC I doing a lot of exploring & camping in the above mentioned areas, a lot of neat & beautiful places to go. When you get settled down, and ready to explore, let me know and I will tell you some nice places to camp. I wish you all good health & happiness in all your endeavors . Thank you Louis! I’d love to get your Idaho camping recommendations. We’re very excited to get to know this beautiful state! Great post! So happy for you and Mark. I hope this chapter in your life will bring you many wonderful memories! Welcome to Idaho. We moved from Oregon, near Mt. Hood, to Wilderness Ranch (30 Miles outside Boise, in the hills, towards Lowman) last year. You will see our white 2006 Tundra and 2014 FWC Hawk on the road, at Luck Peak and in the woods around town. Let me know where you are a CFI at. I would enjoy some seat time in a Kit Fox. Stick time would be fun, too, but I’m hapoy just looking out the windows these days. Thanks for your posts..I’ve learned many things from both of you. Thanks Gary! Mark will be working as an instructor at Stick & Rudder. If you have any interest, you should definitely check it out! I don’t know if you’ve ever been in a Kitfox but they’re really fun airplanes! Wow! I am so happy for both of you. And you’re spot on….better make the most of opportunities as they come up because sometimes it’s the only shot you got at a particular situation. I retired April 20th and have been packing up to hit the road full time to look for property to use as a home base. Love Idaho. You made a great choice. I certainly look forward to hearing about your new adventure. Best of luck to both of you. Transitions. That’s what life is all about. I was so pleased to see at the end of the post that this was not 100% about Mark’s passion. I am a little sad to read this post as a person who has enjoyed reading about these travels and experiences. Hopefully, the photography will turn into something you will continue to share with us. Best of luck to you both. Thanks Chris! I’m so glad you’ve enjoyed our travels and stories. I’ll continue to share them, both aviation and camping related! Our heart is pulling us to Idaho as well. We are currently looking for a small piece of land that we can spend some downtime on. I wonder if that will be enough or if we will need to pull up stakes and make the complete move…. One can never go wrong by following your true passion in life. Doing so allows all the other details to simply fall into place. You both are extremely fortunate to have discovered your passions so early in life. Will there be post(s) of your most recent travels?